The Dragon Road of Mt. Ryokami (Ryokami-san) enshrining our ancestral gods, said to have created our nation. 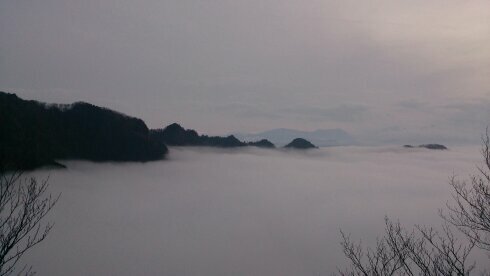 In Spring, the top of Mt. Ryokami, one of those mountains located in the Oku-Chichibu area of west Saitama prefecture, surprises you with its wide carpet of gentle pink Akayashio azalea, which are beautifully blooming in profusion. In Autumn, the mountain changes its attire to one of stunning tinted leaves, which cover its whole surface. Large parts of Mt. Ryokami still retain its original natural forest, and you are assured that you will enjoy a new look every time you visit during a different season. This mountain has long been well known as a sacred mountain, worshipped by the practitioners of the native folk religion. Mt. Ryokami, together with nearby Mt. Mitsumine and Mt. Buko, has been dubbed as the Three Mountains of Chichibu. Ryokami's literal meaning is “both gods” and some say that’s because the sacred mountain enshrines the parent deities of all the deities of the nation, Izanami and Izanagi, mentioned in Japanese mythology. Others preach the theory of a mountain that originally enshrined a dragon deity (ryu-kami), then the name of which changed to the similar-sounding Ryokami. In either case, the background story suggests that Mt. Ryokami has long been a subject of people’s spiritual worship. The enchanting world of flowers that the rich nature of Chichibu delivers starts its season at the end of March. The beginning of Spring gradually brings colors and the mountain’s surface becomes blessed with the bright purple color of Mitsuba-tsutsuji azalea along with Akayashio azalea mentioned earlier. What’s even more magical is the endless spread of anemone flacida, the tiny white blooms of which are typically seen during Golden Week (end of April-early May). The scenery is very mystical and surreal. Autumn is another season you don’t want to miss. Many hikers come to the ridgeline of the mountain to enjoy the magnificent autumn leaves tinting the surrounding landscape with variant hues. But I have to highlight another unique trait of this sacred mountain: its super vigorous and rampageous masculine shape, with jaggy sierra-like ridges and precipitous rock walls spreading sidewise infinitely. The coexistence of the harsh contrast between dazzling, feminine blooming flowers and brutally harsh, masculine contours probably inspired people through the ages to imagine this mountain to embody the deities, hence the essense of the natural world. 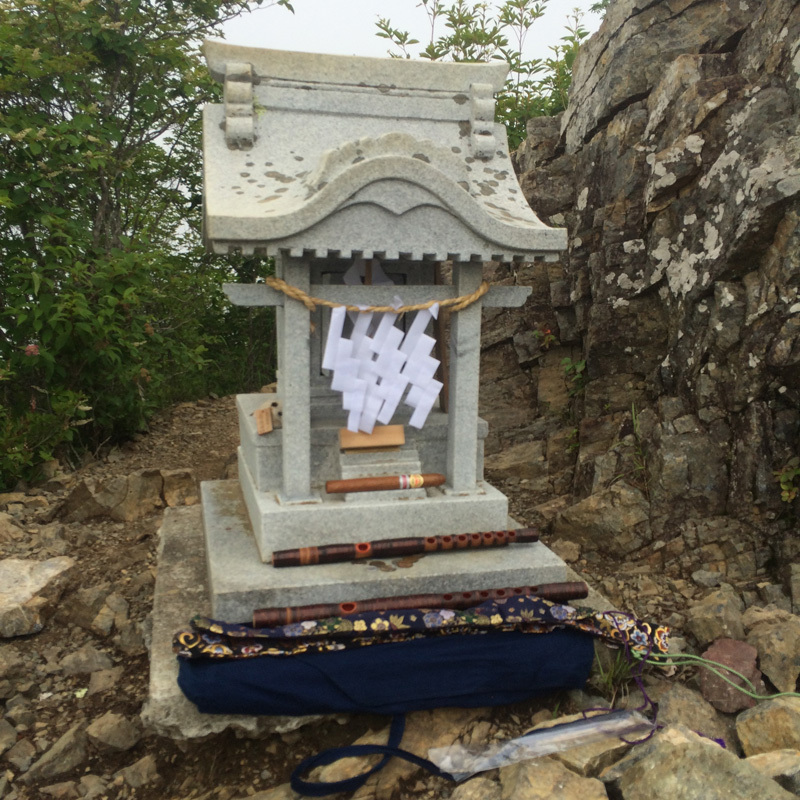 There are several routes to get to the top of the mountain to visit the enshrined deities. The most challenging is the famous Haccho O-ne route, which boasts plenty of impressive rock cliffs and successively-steep rock walls and slopes. It’s roughly 50 minutes of steep climbing from the Kami-ochiai parking point to Haccho Pass. After the Pass is when the challenge really starts. Chains nailed into rock walls, kusariba, appear one after another and the scenery only gets more intense, with endless dizzying rocky stretches. 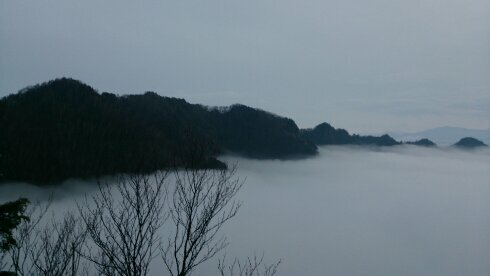 After climbing up and down the two peaks, Gyozo Pass and Nishi-dake (“West Peak”), you reach Higashi-dake (East Peak). It’s only then you get to see the silhouette of Mt. Ryokami. You will be hanging onto the rock walls’ many chains for extended periods at high elevations, so this climbing experience is an intense white-knuckle one for sure. 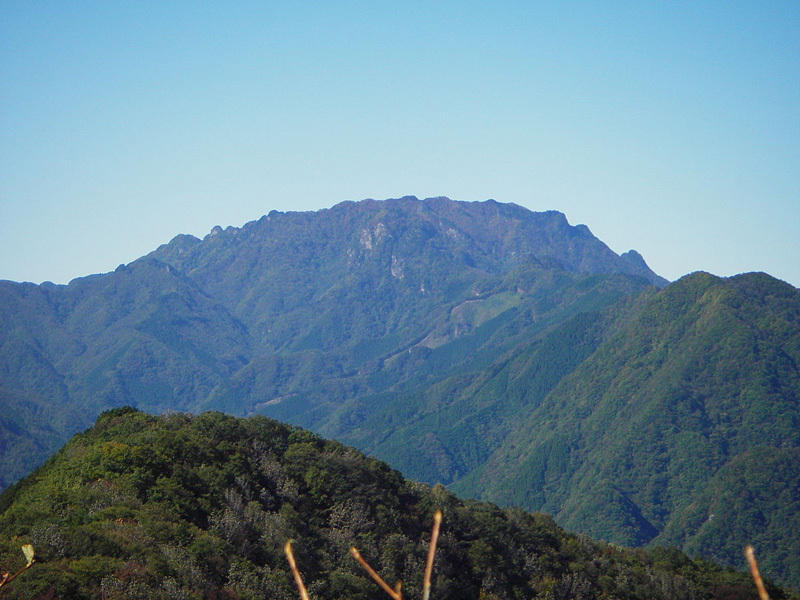 Another route found on the other side of the mountain is the Hinata-Oya route, recognized as the main route for scaling Mt. Ryokami. You will get to experience several kusariba and will be able to cover twice the accumulative elevation distance as the other route in about the same time. 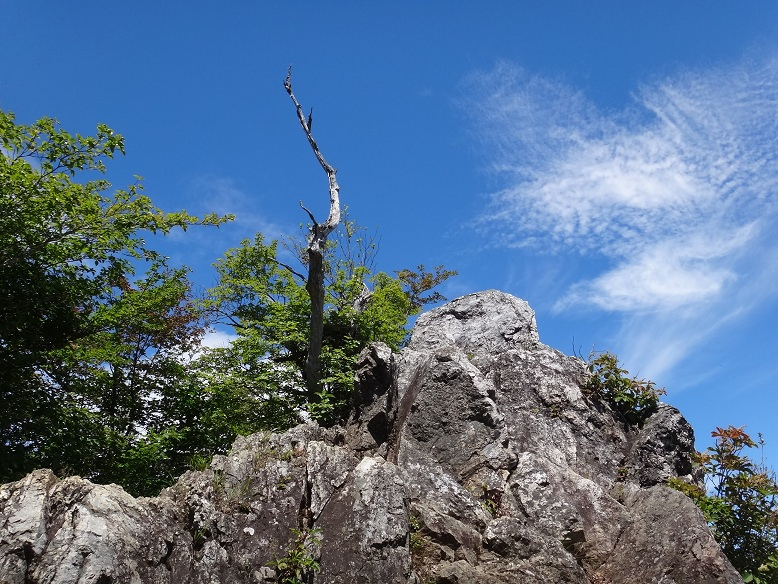 This route begins with a mild mountain trail, on which a statue of the Goddess of Mercy (Kannon-zo) watches hikers go by. After passing the uninhabited kiyomi hut you will encounter the first steep climb and several kusariba. Ahead of you sits the Ryokami Shrine in the mountain. This route hence is the official frontal approach to the shrine, omote-sando. Each of these two routes will take about 3 hours’ climbing to reach the top. The third route is the shortest and quickest route, taking about 2 hours, and is accessible even for beginners. But as this route goes through some privately-owned land, you need to make a call to the land owner in advance should you wish to take it. Nowadays, any one of these routes will give visitors well-established access to the top. But when did the local worship of and coming into the mountain begin? One theory is backed by the Japanese mythological story in which Yamato Takeru no Mikoto, a son of the 12th emperor, Emperor Keiko (13 BC-130 AD), accomplished an expedition into East Japan. The legend of Prince Yamato Takeru is something that has penetrated deep into the local spiritual beliefs of people throughout the Chichibu region. The shrine on Mt. Ryokami, as with those on Mt. Mitsumine and Mt. Mitake, is said to have been built when the Emperor’s son came to the mountain led by a deity “god dog” (in the form of the native wolf of Japan) during his efforts to conquer East Japan. The story claims that he built Ryokami Shrine to enshrine the paired deities, Izanami and Izanagi. 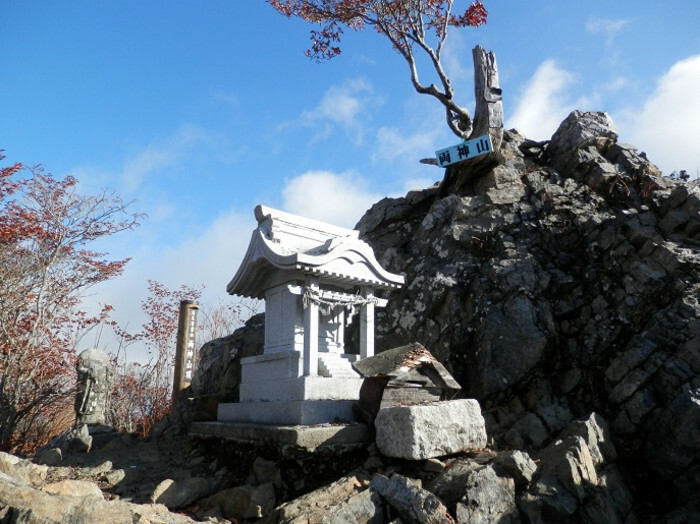 Its innermost shrine (okumiya) stands at the very peak of the mountain, Tsuruga-Mine; the central shrine (honja) is situated on the south ridge; and the in-village shine (satomiya) is at the foot of Hinata-Oya. 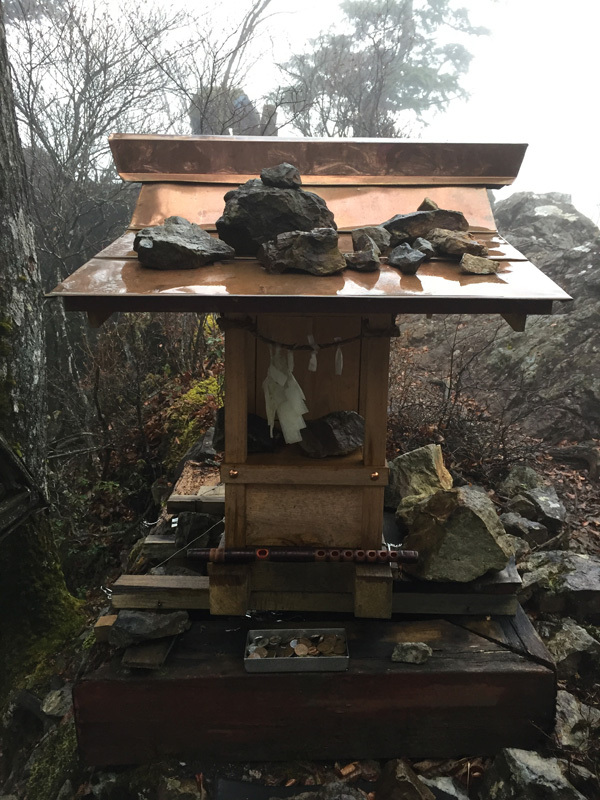 During the Edo era (1603-1868 AC), many practitioners of Shugen-do seemed to have come to this mountain for their intense mountain-worship training. The in-village shrine at the end of the front approach on the Hinata-Oya side became a well-known spot as it is the location of the Kanzoin temple of the Shugen-do practitioners of this mountain. Most probably due to the politically-led separation of Shinto and Buddhism, the shrine’s name got changed to Yachihimi Shrine, as it is currently known. Another local spiritual belief long existed is of a dragon deity. You will find, deep inside the mountain’s forest, an another sacred space and a small structure called, again, Ryokami Shrine. Exactly the same name as the one mentioned earlier, but this one using different Chinese characters meaning “dragon” and “head”. If you look back to where you have just come from after hiking the endless ups and downs of the ridges, you will see how the wiggly, winding trail looks exactly like a dragon’s body, with the peak of the mountain being its head. This local worshipping of the dragon deity most probably dates back further than the “god dog” (wolf) worshipping of the earlier story. In my opinion, the worship of the dragon deity is a form of animism that sprang out organically from the local observing their environment in their everyday life. If the name Mt. Ryokami did indeed come from the “dragon head” meaning “Ryukami”, it’s only natural to think of our walking along the ridges as being like riding the dragon, or taking the Dragon Road.